One of the ways you know Spring has arrived is that fresh asparagus is available everywhere. The stalks are tender and thin, not tough and woody, and the flavor is just delicious. Of course, roasting any vegetable will kick it up to a whole new level of flavor, but this recipe adds a lemon vinaigrette, which is an amazing flavor combination. A huge secret to weight loss is adding variety and making everyday foods seem special. Roasting and sauces do just that! Preheat oven to 400°F. Place the asparagus on a large baking sheet (line with aluminum foil or parchment for easy clean up). Drizzle the oil over the asparagus and season with sea salt and pepper. Spread the asparagus out in a single layer. Roast about 15-20 minutes (depending on how tender you like it). Make the vinaigrette in a small bowl by vigorously whisking together the mustard and lemon juice. Slowly drizzle in the olive oil while whisking constantly. Season with sea salt and pepper. Transfer asparagus to a serving platter, toss with the vinaigrette and serve. This dish may be eaten warm or cold. Depending on how much asparagus is in your bunch, you will have 3-4 servings. 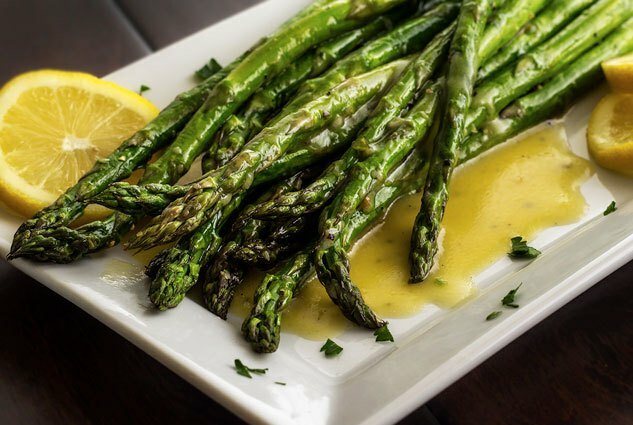 Count 1 cup of asparagus as your vegetable and 1 serving of fat with the vinaigrette included. You can always just eat the asparagus alone or add a pat of butter, as well.